Large low profile platforms, available in wired or wireless configurations. Large format 12.5 inches wide by 27 inches long by 1.2 inches tall. This platform works great for all types of dual wheel as well as large single wheel aircraft. Platforms are available in 15,000 lb, 20,000 lb and 30,000 lb capacity. Dual wheel capable due to the size, low profile allows for use of rubber ramps for easy pull ups. For large duel wheel use on a single platform, measure as shown. Your measurements must be less than 12.5 inches for the tires to fit on the platforms. GIV, GIII, C601, ATR 42, Lear 60, Dash 8, all fit and can use a three platform set up. This PDF download is our measurement document. You can download and print it, use it to help you understand the platform size and use. Please keep in mind, some aircraft may require a larger scale set up like our 737 system which uses 5 platforms vice the three platform system. 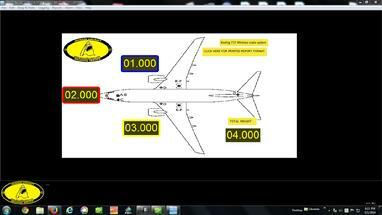 Measure you tires and wheel base as per the instructions to determine if your aircraft will fit. This is an example of what is inside of the PDF download. Our platform live weighing area is 12.5 inches by 27 inches and your tires must fit in this box. EMB 145 on the platforms, this aircraft along with the GIV are about the largest that will fit on our three platform system. EMB Dual nose wheel on the platform. 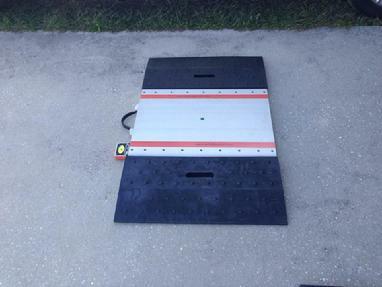 Wired 3 platform sets start at $12,500.00 50 ft cables, digital indicator, complete with ramps ready to use. Large single wheel aircraft can use the platform long wise as shown. Easy on and off, use your chocks! Wireless three platform sets starting at $13,995.00 your choice of a laptop computer or wireless hand held. Dash 6 ? Large tires? No problem. Order HH2400-3-30KP for our hand held unit, easy to use hand held indicator has all the functions right there in your hand. $13,995.00 Calibrated and ready to work.